Soft Tread Anti Slip, Non Skid Coating now in a ZERO VOC formulation. Anti Slip Coatings, Non Skid Coatings, Non Slip Coating, the concept is described by many names, but to increase traction, to prevent slips or falls and generally create a safe footing, that’s exactly what Soft Tread and Safe Tread products do best! 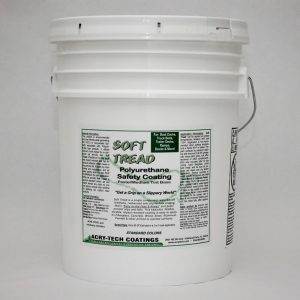 Soft Tread anti slip coating is “Easy on the Feet and Knees”! 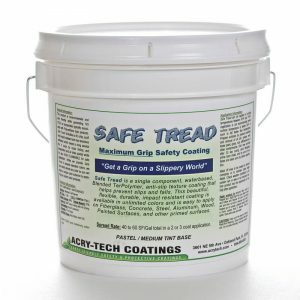 Soft Tread is a unique single component, water-based Polyurethane, rubberized anti slip texture coating that will aid traction and help prevent slips and falls on walkways, stairs, ramps, boat decks, industrial and residential walkways. This beautiful, flexible, durable, impact resistant coating is available in numerous colors and it is easily applied to Fiberglass, Concrete, Primed Steel, Painted Surfaces, Wood or other prepared and primed surfaces. ALSO, it can be used as a protective, anti slip truck bed liner coating, too! 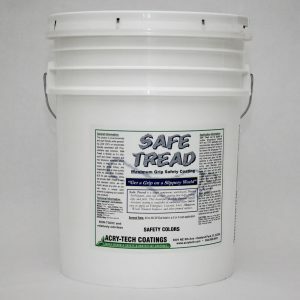 For a more aggresive non skid coating, see our Safe Tread Non Skid Coating for extra traction! With Soft Tread, you can easily and effectively create an anti slip surface on concrete, wood, aluminum or other substrates. Use it as an anti slip floor treatment, create non skid stair treads, transform slippery wood decking, or create safe footing on ramps. And this non skid coating applies easily, it’s a heavy bodied coating that stays put wherever you apply it. Water Theme Parks, Marinas, Yacht Owners, Marina Operators, Golf Courses, Hotel and Motel Owners, Commercial Centers, Industrial Building Managers, Amusement Parks and even Home-owners have found the tremendous benefit of using Soft Tread Protective Polyurethane Anti Slip Coatings. This coating helps prevent slips and falls which are known to be the number one cause of injury in the United States. According to the National Safety Council, Millions of dollars are paid out annually by insurance companies for slip andfall accidents, and the average cost of a slip or fall injury is over $27,000.00. Protecting yourself against the high cost of litigation is important while also providing your guests with a safe environment. 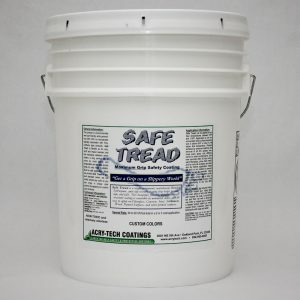 You can enjoy peace of mind and provide top quality protection at your facility or home for a small investment in the application of Soft Tread. A failure to comply with these mandates could result in significant penalties and fines. But, companies that comply may be eligible for substantial tax breaks. Marine: Yacht Decks, Galleys, Shower/Bath, Decks, Docks, Stair Treads, Swim and Dive Platforms, Sun Decks, Gangways, Marine Storage Areas, Engine Rooms and wherever safe footing or anti slip coatings are essential. Residential: Decks, Docks, Spa Areas, Patios, Porches, Pool Decks, Stair Treads, Garage Floors, Walkways, Ramps, and anywhere safe footing is essential. Commercial: Water Parks, Golf Courses, Kitchens, Restroom Floors, Walkways, Steps, Stair Treads, Handicap Ramps, Showers, Ramps, Restaurants, Laundry Areas, Butcher Shops, Entry Ways, Parking Garages, Elevator Floors, Outdoor Decks & Docks, Loading Docks, Clinics, Stadiums and anywhere safe footing is essential. Industrial: Factory Restrooms & Showers, Metal Stairs, Food Preparation Areas, Ladders, Trailers, Loading Docks, Traffic Ramps, and anywhere safe footing is essential. Truck Beds: Makes a great, easy to use and inexpensive liner for protecting truck beds, tail gates, step pads, flooring, and other surfaces where you need great anti-slip properties and rugged durability to help prevent scratches, or other potential damage. Freight won’t slide around when you use Soft Tread Coating so it helps protect your load while it protects your truck. Also can be used on trailer beds, boat trailer walk pads and more! Most importantly, creating a safe environment is the right thing to do. We can help you…’Get a Grip on a Slippery World’. These coatings are environmentally friendly and user friendly while generating NO VOC’s or Isocyanates typically associated with Polyurethane type products. It utilizes Virgin EPDM rubber (or in Black – Recycled Rubber) for an anti-slip surface on most prepared substrates. Soft Tread is flexible so it’s chip, scuff and impact resistant which means a long service life. It cures by evaporation and air dries quickly while it’s also NON FLAMMABLE for safe application and no hazardous fumes. While we provide Soft Tread Coating in several standard colors, we can match almost any color so you can enjoy a unique color scheme by applying our custom colored products. To clean the surface and maintain the beauty of Soft Tread, use general purpose cleaners such as: Tri Sodium Phosphate (TSP), Laundry Detergent (Tide Powder), Citrus Orange Cleaners, Formula 409, Simple Green or similar type products. Also a dilute bleach or caustic cleaner solution. For best results, apply cleaner at recommended dilution rate and scrub lightly with a stiff bristle deck brush. Rinse thoroughly when cleaning is complete. Automatic scrubbers can also be used for large areas. With automatic scrubbing equipment, use light pad pressure only! Heavy pressure can damage the coating material. Colors available for Soft Tread include Cream, Dark Blue, Sand, Light Green, Water Blue, Dark Brown, Dark Green, Medium Blue, Tan, Light Gray, Medium Gray, and Dark Gray. We also have Safety Orange, Safety Yellow, Red, Black, Yacht White, and Brick Red to meet the needs of Safety Purposes. Soft Tread Coating can be applied to easily create a wide range of textures. Soft Tread Coating contains small particle size Virgin EPDM rubber for an “easy on the feet and knees” feel with great traction on wet surfaces. OR, you can apply it to create an aggressive texture by changing the application technique. You can apply a light base layer and then apply a heavier layer on top with our special open foam roller to increase the texture or you can brush a smoother layer on top for areas that require less texture relief but still require great anti-slip properties. Create a slightly heavier texture for areas of heavy foot traffic and light vehicular traffic where good anti-slip properties are required. Create a slightly smoother texture for kitchens or galleys where mopping is frequent and an easy-to-clean surface is a requirement. Soft Tread Coating is designed for use indoors or outdoors in wet or dry environments. Soft Tread is made for outstanding resistance to water and humidity, chemicals, solvents, and stains. Soft Tread Coating is flexible and has excellent adhesion to most substrates while exhibiting excellent abrasion resistance and increased traction. Love this product on our fiberglass scaffold plank. Easy to apply, easy cleanup and gives has great anti-slip properties. Non-flammable and chemical resistance are a plus in our industry.